Designed to fit your Ruger LC9, this ProMagTM Blued Steel Magazine will provide guaranteed reliability and smooth-feeding action for your favorite handgun. 10-round capacity with polymer follower, lock plate, and base plate. 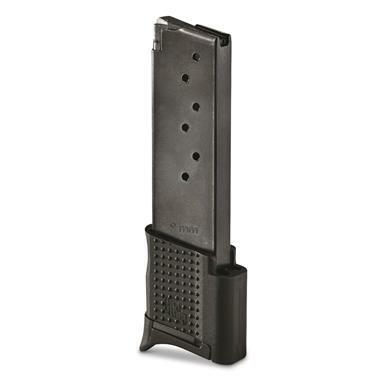 ProMag Ruger LC9 Magazine, 9mm, 10 Rounds, Blued Steel is rated 5.0 out of 5 by 4. Rated 5 out of 5 by Doug24 from 10 round quality mag for EC9s Bought this magazine to try it out for my Ruger EC9s fit is great for going to the range but is a bit long for concealed carry. But overall it performed just fine at the range. Rated 5 out of 5 by Bo Bo from great product This magazine works great in my Ruger Lc9s. No jams after hundreds of rounds fired.